Sending email has never been easier than it is in Outlook 2016. You’ll notice the familiar Ribbon interface, and you’ll still find all the Outlook features you’ve come to love — plus some new ones. Use this handy Cheat Sheet to orient yourself with Outlook’s new look and feel. There’s also a helpful table of Outlook shortcut keys. The Mail Home tab on Outlook 2016’s Ribbon contains all the tools you need for daily email tasks as well as for managing the messages you accumulate and retain for reference. 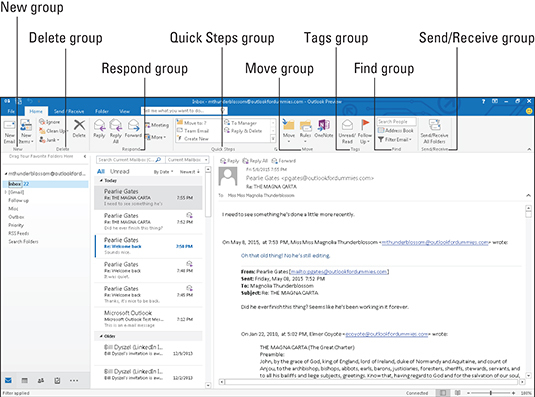 The following image shows you what each of Outlook 2016’s Mail Home tab buttons can help you do. The Calendar Home tab on the Outlook 2016 Ribbon lets you choose how you prefer to view your appointments. You can choose among views for a day, a workweek, a week, or a month, as shown in the following image. You can also choose a schedule view for seeing several schedules at once. Outlook 2016’s Contacts is more than just a list of names and email addresses. 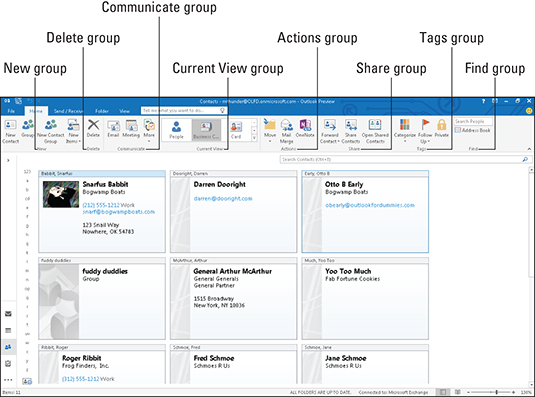 You can take advantage of the Contacts Home tab on the Outlook 2016 Ribbon to create new contacts, to arrange the way you view the contacts you have, or to create email messages or mail merge documents. The following image shows the popular Business Card view. 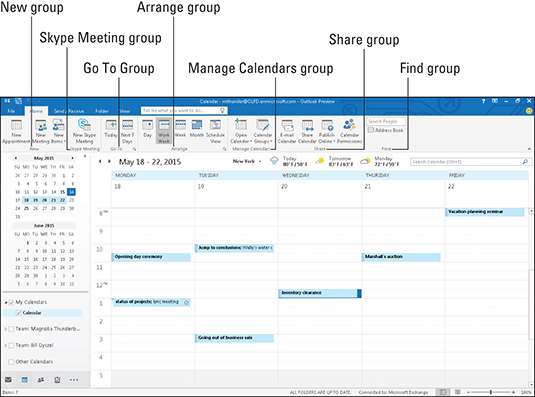 More than an email program, Outlook 2016 can also help you schedule and track personal and professional projects. 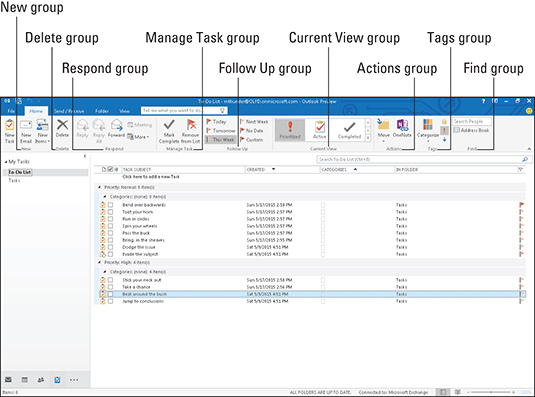 On the Tasks Home tab on the Outlook 2016 Ribbon, you’ll see tools for managing your workload more quickly and effectively, as shown in the following image. You can choose from a variety of views that can help you keep track of pressing priorities. You can accomplish tasks a lot faster when you use Outlook, and you can be even faster if you use Outlook’s shortcut keys. The following tables offer several handy shortcuts to help you work more quickly and more efficiently with Outlook 2016.